Museum culture: Are we losing it? Jagdish and Kamla Mittal are well known in a city made famous by the legendary passions of the Nizams of Hyderabad. The Mittals, who met when they were both students at Santiniketan, moved to Hyderabad after Independence, where they began their quest for the rare treasures of Indian art. 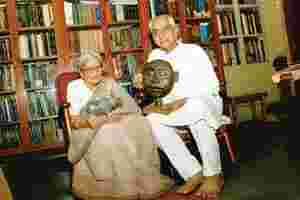 Now in their 80s, they have entertained many famous scholars of Indian art from around the world. They have also loaned artefacts from their collection to be featured in books and exhibitions—and have now decided to share them with a larger audience. The book, Sublime Delight Through Works of Art, is “the largest single gift to the nation," says Jagdish Mittal. He refers to the decision they made to pledge their collection to an irrevocable public trust named Jagdish and Kamla Mittal Museum of Indian Art for the setting up of a museum in Hyderabad. According to them, it consists of miniature paintings, drawings, textiles, metal ware, terracottas, wood-carvings, glass, ivory and jade objects as well as utensils with metal inlay from the Mughal period. It ranges in vintage from the first century BC to 1900 AD and is a valuable record of the traditional arts and crafts of the subcontinent. One of the samples in terracotta is of a seventh century female head from Akhnoor, the mouth and chin of the lady moulded with a slight smile that is reminiscent of a Botticelli Venus as well as a Buddhist Tara. There is something of interest in almost every category. Many of the items have appeared in the monographs of scholars around the world as well as in ‘Festivals of India’ abroad. The Mittals were at Santiniketan at a time when the great teachers of the era, the late Nandalal Bose, Benodebehari Mukherjee and Ram Kinker Baij, were in residence. The artists of that period were intent on discovering the roots of Indian art. Jagdish Mittal too began to make his own journey into this world. The late N.C. Mehta, at that time the chief commissioner, was already well known as a collector (his collection may be seen in Ahmedabad) and provided scholarly guidance to the Mittals, who believed that “all great works, whether created by an urban professional artist, craftsman, a tribal or village artist or artisan, can lead to aesthetic exhilaration" (as noted by Naozar Chenoy in the introduction to the book). The couple also did not have the resources enjoyed by most collectors of that time, such as the British civil servants and their Indian counterparts, who had access to what was in the field, and what was imitated by Maharajas and the rich land-owners who became the elite in the days of the Raj. The Mittals were perhaps fortunate to be in a place such as Hyderabad. Not only did they have the remains of the Nizam’s fabled past to pick through, the region was rich in antiquities from Jain, Buddhist and Hindu sources and also had a thriving rural community base. The Deccani style of paintings, the printed and embroidered Telia Rumales and the cotton Ikats have all found a place in their collection. In some instances, as in the completely unknown Tirupati style of painting, the Mittals have saved dying traditions from neglect. Sublime Delight Through Works of Art—edited by Jagdish Mittal; 256 pages, with 200 illustrations; published by Jagdish and Kamla Mittal Museum of Indian Art, 2007. It makes one wonder about the future of the collection. There are many other examples of the singular obsession that leads to one person, or a family, trying to save the objects around us in the form of a museum. 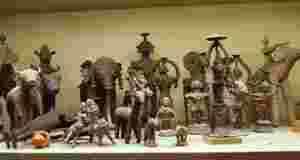 One thinks of the Gurusaday Museum started by Shri Gurusaday Dutta in Bengal with objects that he collected between 1925 and 1941 on the outskirts of Kolkata, or the Raja Dinkar Kelkar Museum in Pune that was set up by Dr D.G. Kelkar (1896-1990), or even the famous Salar Jung collection at Hyderabad, the main part of which was put together by Salar Jung III, Nawab Mir Yusuf Ali Khan in l951. Similar is the case of the Calico Museum in Ahmedabad, the Crafts Museum in New Delhi, when it was under the care of Dr Jyotindra Jain, or, in the not so distant past, the Bhopal Museum for folk and tribal arts under the late J. Swaminathan. Once the initial curator has faded from the scene, the place quite often reverts to a state of dismal neglect. It’s clear that what happens in most of these cases, the persons who are in charge of them are completely indifferent to their care and maintenance. Unless there are competent curators, scholars and art enthusiasts who can handle the objects from our recent past with delicacy and passion, these remain dust-covered moth-eaten samples, as dead as the displays exhibited in the majority of our government museums. In contrast, in places such as Singapore, Malaysia, Thailand and Indonesia, for instance, the preservation and inter-active display of cultural heritage is a priority. Each of the different communities is given due importance. They are visited by tourists of course, but more importantly are the regular visitors, students, families who go to a museum as a Sunday outing, as well as serious scholars. Until an enlightened state policy is implemented, or the private sector is willing to fund these specialist museums, the ‘sublime delight’ that the Mittals hope to share will only be equalled by the sublime neglect that is their current fate.